What’s Behind Myanmar’s Big New Military Exercise? The holding of the first tri-service exercise in over two decades needs to be viewed from a broader perspective. From February 2 to 4, Myanmar’s military carried out their first tri-service exercise in over two decades. The drills reinforce the military’s determination to advance its modernization even amid continued international scrutiny over its behavior. As I have noted before, though Myanmar’s military, known as the Tatmadaw, is said to number around 400,000 and is technically one of the biggest armed forces in Southeast Asia, its capabilities also continue to significantly lag behind some of its neighbors. In recognition of this reality, Myanmar’s military chief Min Aung Hlaing has sought to further develop and modernize the institution into what he has recently been terming a “standard army,” with a variety of steps including acquiring new weapons, building relationships with foreign militaries, and trying to improve areas like recruitment and training (See: “What’s Behind the Myanmar Military Chief’s Europe Voyage?”). This continues to be the case today even though some of this process has been complicated by the election of Myanmar’s first civilian-led government in a half-century and international scrutiny over the treatment of Rohingyas in Rakhine state. And although this is a multi-pronged and ongoing effort, international attention to Myanmar’s military capabilities tends to surface more so with certain occasions, be it military exercises or anniversaries of different services, as we saw last December with the commemoration of the 70th anniversary of the country’s air force (See: “Myanmar’s Military Modernization in the Spotlight Amid Air Force Anniversary”). Last weekend, in another headline-grabbing development, the Tatmadaw completed the first major tri-service exercise in over two decades. 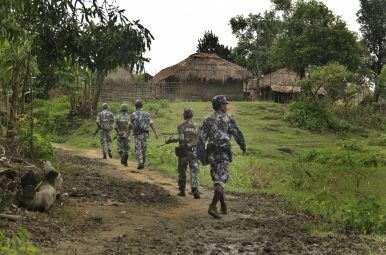 The exercise, which was designated Sinbyushin – the name of a former 18th century militaristic Burmese king known for his wars against China and Siam (now Thailand) – involved three days of activities and occurred east of the city of Pathein where the army’s southwestern command is located. Local media sources indicated that over 8,000 troops participated in the exercise, which also occupied 500,000 acres of land and took around two months of preparation involving personnel as well as a whole range of military equipment from the army, navy, and air force. The last time such as massive drill was organized was back in 1996, attesting to its significance. The drills themselves included artillery shooting, bombing by aircraft, and securing a beachhead. What’s Behind Myanmar Military Chief’s Europe Voyage?Myanmar’s Military in the Headlines With 71st Air Force AnniversaryMyanmar Military Modernization in the Spotlight Amid Air Force AnniversaryMyanmar Military Might on Display in Parade Amid Democracy ConcernsWhat's Behind the New Constitution Change Push in Myanmar?